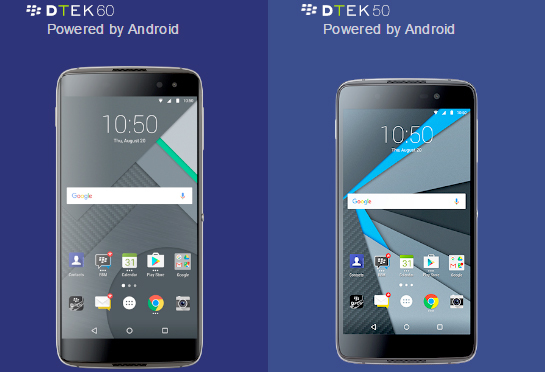 BlackBerry DTEK50 and DTEK60, are the newly self-styled Mobile phones powered by Android Os from Blackberry. The firm has just announced a follow-up to the popular device, the aptly-named BlackBerry DTEK60 and Blackberry DTEK50.If we’re to believe anything BlackBerry tell us these days the DTEK60 and DTEK50 are the “world’s most secure” Android smartphone.According to Blackberry – ”You wouldn’t put money in a bank that didn’t lock its safe. Or leave the doors of your home unlocked at night. Having a smartphone that doesn’t take your privacy seriously is the equivalent. The DTEK60™ and DTEK50™ ensure that how you share the private details of your life—your location, your pictures, your texts—is your decision. Not all smartphones are equally secure. With the DTEK series of smartphones, you have built in armor protecting your personal information”. BlackBerry® sets the bar in incident response and patch management, brings its world-renowned security experts and testing to the new line of BlackBerry secure smartphones powered by Android™. DTEK60 and DTEK50 come with Android 6.0 Marshmallow, giving you full access to Google Play, home screen widgets, Google Now™, and the ability to easily connect to the things you use every day like your TV, car and connected systems in your house.BlackBerry® Pop-Up Widgets allow you to view any app widget by simply swiping up or down across the icon on your home screen, giving you fast and private access to the information you need, when you need it.The DTEK60 and DTEK50 each have a stunning display, made of scratch-resistant glass with a specialized Oleophobic coating to protect against fingerprint smudges. The DTEK60 sports an incredible pixel density that’s 4x the amount of pixels of a standard HDTV. And because the display is AMOLED, it delivers richer colors and deeper black levels with less power consumption. As the company that put email on phones, BlackBerry knows a thing or two about how to make productivity on a smartphone effortless. Whether it’s integrating all your email, text and social messages into one place, or giving you a really smart keyboard, everything you do on your DTEK60 or DTEK50 is intuitive and efficient. Keyboard : On screen BlackBerry® Keyboard, Contextual auto-correction, next-word prediction and a personalized learning engine that gets to know the way you type with on screen flick typing or seamless flow typing. We are happy about the new innovation – ”Blackberry phones now on Android OS” , you will also be happy to read this new innovation too . You will now have the opportunity to use the world most secured Android phones from Blackberry. If you are looking for where to buy the latest Blackberry DTEK 60 and Blackberry DTEK 50 in an online store when it is available in Nigeria. Kara.com.ng is the best online shopping website to buy all the latest Blackberry phones on Android at best price in Nigeria. Enjoy fast delivery to your location and flexible payment option available. Blackberry Android phone Blackberry DTEK 50 Blackberry DTEK 60 Latest Blackerry Android Phones.